The Republicans who control Pennsylvania's House and Senate are now chewing over Democratic Governor Tom Wolf's budget proposal. GOP lawmakers broadly like Wolf’s plans for workforce investment and education investment. But other things, not so much. The Republicans who control Pennsylvania’s House and Senate are now chewing over Democratic Governor Tom Wolf’s budget proposal. 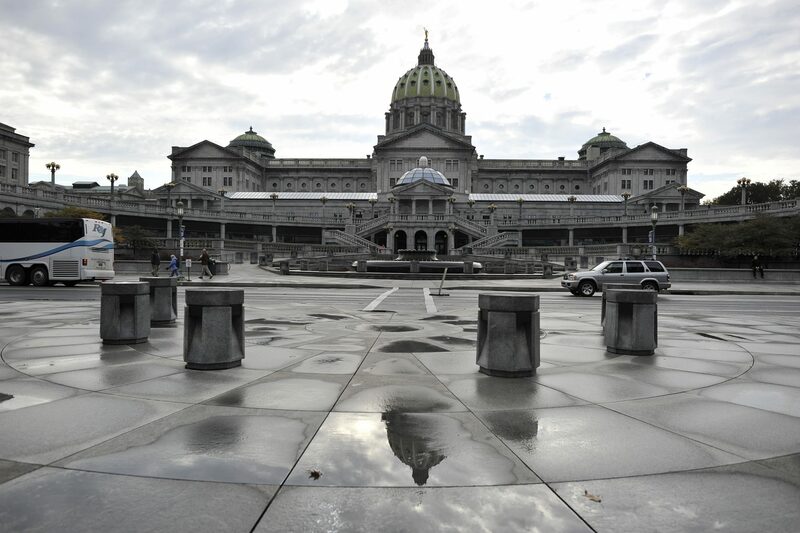 (Harrisburg) – There weren’t many surprises in Governor Tom Wolf’s latest budget proposal to the Republican-controlled House and Senate. The​ Democratic governor spent the first three, deficit-plagued years of his tenure repeatedly clashing with legislative leaders over his attempts to raise certain taxes. Then, ahead of his reelection campaign last summer, he opted for a light-on-taxes plan and avoided an impasse. This time around, he seems to be heading in the same direction. 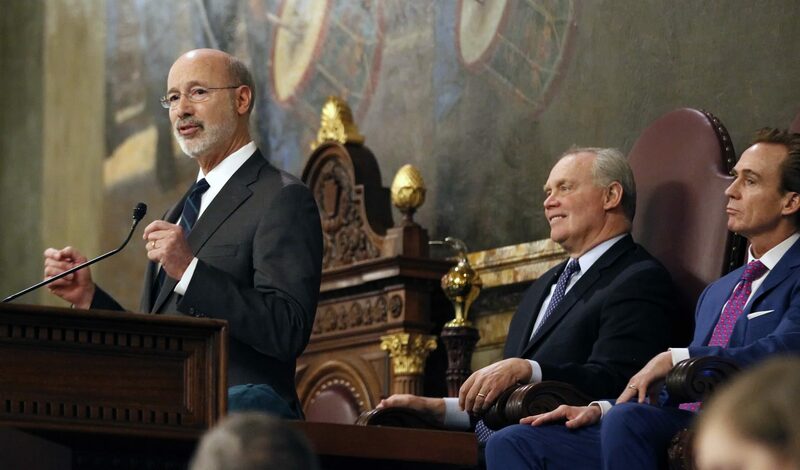 There aren’t any new taxes in Wolf’s budget plan for fiscal year 2019-20 — though he is proposing a natural gas severance tax through legislation. Republican responses to the budget plan were largely positive. But there are some things that likely won’t make it through the GOP gauntlet. This is one of Wolf’s white whale issues. He has proposed raising the commonwealth’s wage above the federal $7.25 minimum every year he has been in office. Twenty-nine other states have set higher minimums, including those that border Pennsylvania. Wolf argues his plan to increase the wage immediately to $12 an hour, and then gradually up to $15, would put more money in consumers’ pockets. He predicts it would save the state about $120 million in public assistance costs — a number he’s using to partially offset the $927 million in new spending he’s asking for. Republicans have — for the most part — never been on board. And this year doesn’t look much different. He cited a report the state’s Independent Fiscal Office released last year that found a $12 wage might lose the state around 33,000 jobs. House Majority Leader Bryan Cutler (R-Lancaster County) backed him up. He said he thinks the ultimate goal of a $15 hourly wage is too high, and that the conversation shouldn’t be part of the budget process regardless. 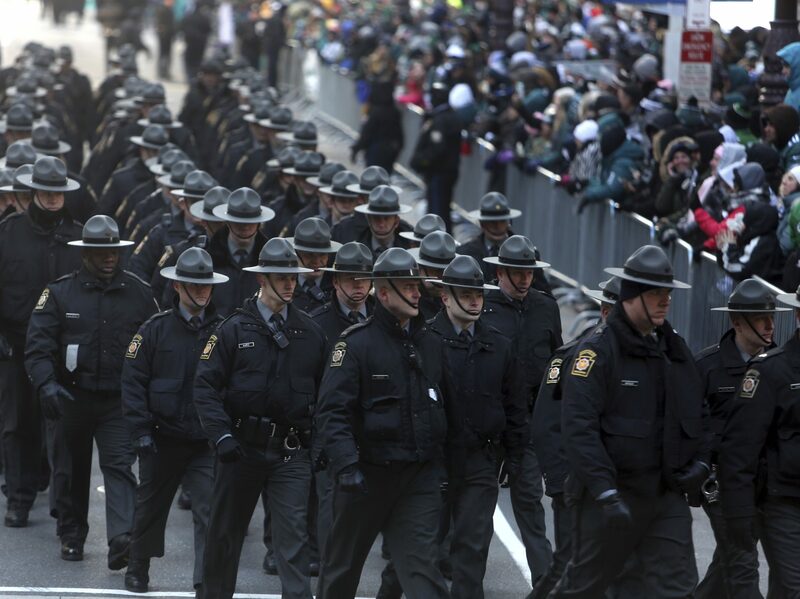 FILE PHOTO: State Police deploy before the Eagles team parade and celebration Thursday Feb. 8, 2018 in center city Philadelphia. Wolf wants to assess a sliding-scale fee — $8 for communities with 2,000 or fewer residents, and increasing $8 or $9 per capita for every thousand residents up to communities of 20,000 or more — for municipalities that don’t have their own police forces, and so rely on state police. He thinks it would net around $108 million. The move is designed to save state police money, and gradually get the department to stop drawing dollars from the state’s Motor License Fund, which is supposed to be used primarily for road and bridge construction projects. Republicans don’t oppose the general concept. But there is a lot of disagreement over exactly how fees should be levied. Senate Republican Leader Jake Corman (R-Centre County), for instance, wants to make sure the fee isn’t so low that towns and small cities won’t be motivated to pay to create their own police forces. Meanwhile, Saylor said he’s concerned the levy would be unsustainably high. The governor wants to raise spending by almost a billion dollars over last fiscal year — $927.36 million, to be exact. It’s a 2.79 percent more than the state spent last year. Even if Republicans liked two of Wolf’s major funding proposals — minimum wage savings and the police fee — they’re indicating they think the spend is too high. Since Republicans aren’t inclined to accept any tax increases, it means the GOP will try to winnow down Wolf’s spending proposal, one way or another, before June 30. Wolf says this revenue-neutral proposal would lower the state’s Corporate Net Income Tax from the current 9.99 percent to 8.99 percent at the start of 2020. Then it would be reduced in increments every year until hitting 5.99 percent in 2024. That’s not a problem for Republicans, who have wanted to see the CNIT reduced for years. The sticky part is the provision that keeps it revenue-neutral. Wolf wants to implement mandatory combined reporting for any company that does business in Pennsylvania. It’s a tax collection method designed to keep businesses from sheltering assets in low-tax states to skip paying some corporate state taxes, and it would ultimately put more money in state coffers. Republicans are cagey about committing to it. Cutler said he would prefer to keep a comprehensive tax reform discussion separate from budget negotiations. Nestled deep in the budget, in a back section devoted to special funds not counted in the total spend number, is a provision that eases back the amount the state kicks into the School Safety and Security Fund, which launched just last year. It would lower the amount disbursed to schools from $60 million this year to $45 million next. And while it’s a miniscule number in the context of the whole budget, it had the distinction of being a rare area where Republicans called for additional spending. Schools can receive the money as grants to implement security measures, like buying metal detectors and hiring psychologists or security officers. Corman said he was “disappointed” in the change and would be looking for more cash. Money goes into the school safety fund via commitments from the Legislature, courts, and general fund transfers authorized by the administration. A spokesman for Wolf said the office had maintained $15 million from the courts and executive branch. The Legislature would be able to increase its own commitment. FILE PHOTO: Gov. Tom Wolf, left, gives his budget address at the state Capitol in Harrisburg, Pa., on Tuesday, Feb. 6, 2018. Boosting education funding has been one of the pillars of Wolf’s time in office. This year’s ask is $200 million — much less than he wanted in his first year, more than he wanted last year. Some of the things he wants to do with that money, like requiring schools to pay teachers at least $45,000 annually, earned a side-eye from Republicans. But details aside, they met the proposal with open arms and seemed willing to approve the cash. This was by far the most popular component of Wolf’s budget. Republicans have long preferred programs aimed at getting people into skilled labor over minimum wage hikes, and they embraced Wolf’s raft of relatively-low-cost proposals. One would create a so-called Workforce Command Center that would be chaired by both union leaders and business backers, designed to coordinate job development efforts across state agencies. Another would route $5 million more dollars into the PA First program, and yet another would put $12 million toward grants for in-state employers. Wolf also proposed expanding tax credits for farmers who use the state’s best practices for land management and conservation, allocated $1 million to increase awareness of farming opportunities, and suggested earmarking $5 million to respond to blights, infestations, and other agricultural disasters. Wolf wants to spend $5 million on an initiative he calls Parent Pathways. It would be a pilot program that the governor envisions including things like housing support, childcare, and career counseling for lower-income parents who are working or going to school. Senate President Pro Tempore Joe Scarnati (R-Cameron County) is a fan. A lot of people still die in Pennsylvania from opioid overdoses, and finding a way to lower that death rate has always been a bipartisan issue in Harrisburg. Lawmakers haven’t always agreed on the best ways to do that, but Wolf’s latest suggestions went over well. He wants to put $1.5 million toward buying the overdose reversal drug naloxone. The state has previously given its stores to some first responders, and has held open giveaway days for any Pennsylvanian who wants to carry naloxone. Smart Talk: Did new district maps change election results?